The ideal desktop publishing program for business, and small- and home-office professionals who want to Design and print high-quality publications. 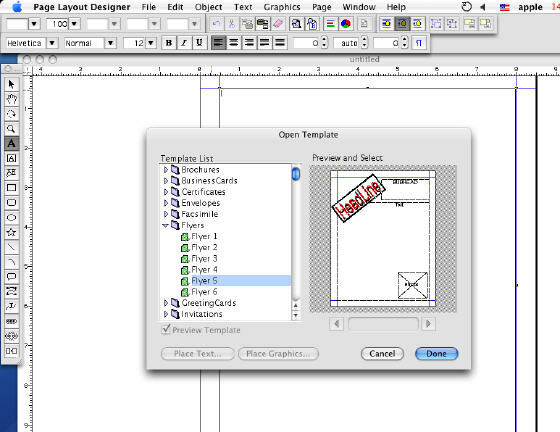 iWinSoft Page Layout Designer is the ideal desktop publishing program for business, and small- and home-office professionals who want to Design and print high-quality publications like newsletters, flyers, postcards, brochures, labels, business cards, ID cards, greeting cards, invitations, envelopes, facsimile, letterheads, memos, etc. with great ease. With professionally designed templates, images, fonts, typestyles, and special text and image effects, you're well on your way to creating high-impact and unique marketing documents that will leave a lasting impression with your customers or clients. It's the easiest desktop publishing software available. Professional results With Your Own Style. If you are not completely satisfied with our Products, you may return it for a full refund within 30 days of purchase. Secure on-line ordering. it is 100% secure! iWinsoft Page Layout Designer for Mac is the ideal desktop publishing program for business, and small- and home-office professionals who want to Design and print high-quality publications like newsletters, flyers, postcards, brochures, labels, etc. with great ease. iWinSoft CD/DVD Label Maker for Mac - a fast, easy to use, intuitive CD and DVD labeler for Mac OS X lets you make great-looking labels for CDs and DVDs. 4Media Video Converter for Mac - Versatile Mac Video Converter Software which can convert between almost all video and audio formats like MOV, AVI, WMV, MPEG1/2/4, 3GP, ASF, MP4, MP2, MP3, WMA, OGG, AAC, M4A, WAV and AC3 etc. 4Media DVD Creator for Mac - Provide easy and fast ways to convert MPEG to DVD, DivX to DVD, burn AVI to DVD, DVD folder to DVD, DVD ISO file to DVD for Mac! Flash Optimizer for Mac - a powerful, feature-rich SWF compression utility which can dramatically compress SWF files up to 60-70%.